As one of the most popular Japanese foods along with sushi, tempura has already gained global popularity. It is regularly ranked among the top in popularity votes for favorite Japanese food by foreign tourists to Japan. Tempura is prepared by dipping seafood or vegetables in a batter made of flour, water, and egg, and then deep-frying them in vegetable oil. At high-end tempura restaurants, it is often served simply with salt to enjoy the crispiness of the freshly-cooked batter. Otherwise, tempura generally comes with tentsuyu, or slightly-sweet dipping sauce made of dash stock, mirin, and shoyu, along with garnishes to be mixed with the sauce such as grated daikon radish and grated ginger. While tempura is often considered as a food for special occasions, it is commonly prepared at home in Japan. Tempura is also found regularly at the deli section of supermarkets. Tempura can be enjoyed in various ways in addition to eating it as it is to enjoy its crispy crust. Tempura makes a great topping for soba or udon noodles. Tendon, a rice bowl topped with tempura and sweet shoyu-based sauce, is another popular menu with tempura. Each tempura dish provides different tastes and flavors, so make sure to try different tempura menus if you have a chance. From a fancy specialty restaurant to a casual soba stand, select a type of restaurant according to your budget, atmosphere, and available menus. A bowl of white rice topped with tempura. When served in a jubako (tiered box) instead of the bowl, the same dish is called tenju. A combination of zaru-soba (cold soba) and a plate of assorted tempura is another standard tempura menu. A hot soba noodle with tempura on top was first created during the Edo period. Tenmusubi or tenmusu is a type of onigiri (rice ball) made with a salt-seasoned shrimp tempura as a filling. Is it originally from Europe or Japan? It is said the word tempura is originally Portuguese or Spanish. The record shows there was a type of battered and deep-fried food similar to tempura eaten during ancient times from the Nara through Heian periods. However, its batter was made with rice flour instead of wheat flour. The common belief about the origin of tempura is a European style fritter, which was introduced to Japan during the 16th to 17th centuries and uniquely developed into today's form of Japanese tempura. 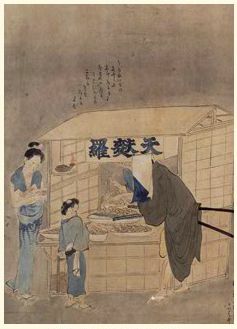 During the Edo period, tempura was considered more like a common snack food and was cooked on a skewer at a tempura stand where customers ate it while standing up. 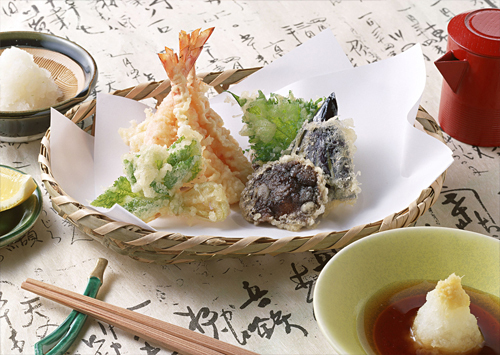 Restaurants specialized in tempura were born after the Meiji period.